[AUTO](VC):When placed, activate all of the effects below according to the sum of the grades of the face up cards in your bind zone. 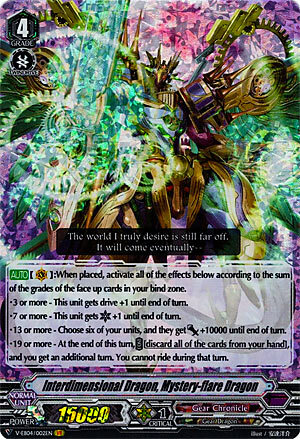 • 3 or more – This unit gets drive+1 until end of turn. • 7 or more – This unit gets [Critical]+1 until end of turn. • 13 or more – Choose six of your units, and they get [Power]+10000 until end of turn. • 19 or more – At the end of this turn, COST [discard all of the cards from your hand], and you get an additional turn. You cannot ride during that turn. I suppose any comments and drawbacks I talked about regarding Idealize Dragon could also apply here. Like Idealize, this is something you run at like 2 just to not throw balance off in terms of Grade ratio. Don’t try to shoot for all those effects going off though because in all honesty, that’s a bit too much work and resources spent for something where you could lose before that happens. But pretty neat if he goes off. Again, don’t ride him unless you absolutely need the 15k base defense.